Today we sit down for an interview with cozy mystery author Mary Ellen Hughes. Learn more about her and her books at her website. After writing a few short stories, I realized I wanted to write longer, more in-depth stories. About five years after my first short story was published. Traditionally published, but I’ve reissued earlier books that I regained the rights to. Upstairs in a spare room, next to a window where I can watch the seasons change as the book progresses. Definitely silence. I enjoy music too much to be able to ignore it. I don’t write “ripped from the headlines” plots, but since I also don’t write science fiction, some things have to come from real life, just hopefully with added drama and twists. An inspiration for my Keepsake Cove series came from something that happened to friends. They had bought an 18th century house, and as they moved in, they were greeted by the faint sound of music. They tracked it to a music box, found locked inside a roll-top desk. How it got wound up or turned on, they had no idea. 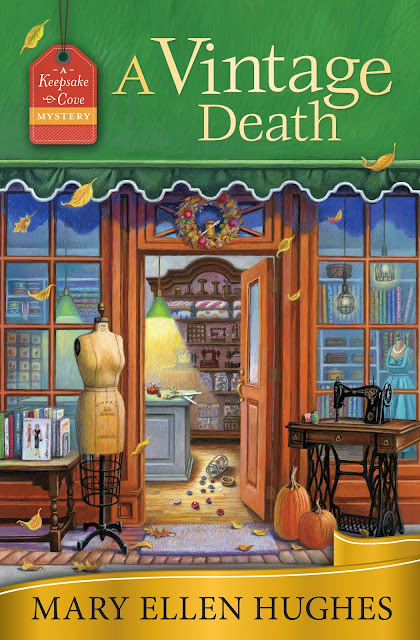 In A Fatal Collection and A Vintage Death, my protagonist, Callie, seems to get messages through a family heirloom music box that plays on its own at critical times. Warnings? Confirmations of clues? Callie is never 100% sure. I’ll search through baby-naming books and also the Social Security list of popular names by decade to find the perfect name for a character. If she’s 60-something, she probably shouldn’t be named Ashley, and a teenager is unlikely to be named Hilda. I also avoid having names start with the same letter, which tends to confuse the reader. I create fictional towns, but place them within reach of real cities. Tabitha, the part-time assistant in the music box shop, has a thing for dressing, um, creatively. She might show up to work looking like a 1940s Joan Crawford or Wonder Woman’s alterego, Diana Prince. Luckily, Callie’s music box customers enjoy it. I don’t think I have any, but since we all think of ourselves as normal and everyone else as a little odd, I’m probably not the best one to ask. Ohhh, so many. But more recently, I would love to have written the Harry Potter books or Stephen King’s 11/22/63 about the time traveler who tries to stop the Kennedy assassination. Such impressive imagination in both! I might have majored in English instead of science, which might have led to writing much sooner. Believe it or not, it was in a bookstore (a now-extinct chain.) I thought it would be wonderful to be surrounded by books, but I was usually too busy to open them! That changes from month to month as I enjoy one good book after another. I’m currently polishing A Curio Killing, the third book in the Keepsake Cove series. Just that it’s been an amazing ride, having ten books published with the eleventh on the verge. It’s hard work, but for me, the best job in the world. And hearing from a reader who’s enjoyed them or getting a positive customer review is absolutely the icing on the cake. Thank you, Killer Crafts, for hosting me on your terrific blog site!